Kristoff swallowed, staring determinedly at the wall. I managed to just catch a glimpse of the returning blush on his face as I ducked into my cabin. I shucked the wet nightgown as quickly as possible and put on a dry one, then wrapped myself in a dressing robe and found my previously forgotten slippers. Digging through my wardrobe revealed a knitted cabled jumper, a pair of men’s trousers, some socks I had knitted for myself but which had turned out to be entirely too large, and a set of striped nightclothes. I squinted at them, trying to remember why I owned such things… Oh, yes! My absentminded younger brother Colin had left them behind when he joined me on the dirigible for a short journey a few years back. I had to admit to being similarly absentminded, considering I had forgotten all about the items. No matter! They would be put to good use now. I added a spare dressing gown to the pile and headed back to the galley, which I found empty except for a pot of hot tea on the table and a still-steaming kettle sitting on the sideboard. Clearly Kristoff had gone to change out of his wet clothes… But into what, I wondered, looking down at the folded garments in my hands. I smirked a bit and headed to his cabin. “No! No. Thank you.” The blush was slowly re-emerging in his cheeks. “You can just… Leave them outside the door and I’ll grab them when I have a moment.” He shut the door quickly, then cracked it again just as quickly. “Anna… Thank you. I do appreciate it.” His eyes dropped from mine to the pile of clothes, and then to the neckline of my second nightgown, visible under the my untied dressing gown. His eyes snapped back to mine with a quickness, and the blush came back full-force. “I’ll see you in the morning.” He shut the door again, and as I bent down to deposit the clothes outside his door I heard him mutter, “Why must she walk around half-dressed? !” I giggled wickedly as I slipped back to the galley and poured myself a cup of tea. “Because it’s ever so entertaining, Kristoff…” I whispered into my cup. Oh, I’m a terrible person, I really am. He’s just so fun to tease! How can I resist? No one could resist once they saw that blush. It’s simply adorable and ever so endearing. I presume he’ll eventually become used to seeing me in a nightgown, so if I want to continue seeing that blush I may need to resort to other tactics in the future. Perhaps a letter to Miss Alyssa Rynne is in order? We shall see later. For now, diary, I am off to my warm bed while the wind blows itself out around me. I hope Kristoff sleeps well… It was quite an evening. Oh, that Anna! Our ladies sure knew how properly (or perhaps improperly) intrigue a gentleman, while still conducting themselves appropriately – a skill lost on much of the modern dating scene, it seems. Though we have another reference to the mysterious Miss Alyssa Rynne (you’ll recall Miss Sett’s correspondence with her) and her knowledge of such “tactics”. Hmm… I hope to find some more information on her soon! And I’m very glad Anna and Kristoff made it through the storm and landing intact. Perhaps further diary entries of their journey into Constantinople will turn up as well. I’ll keep my eye out, as always. In the meantime, stay tuned for an exciting surprise coming next week! Good evening my colleagues! I hope you’re having a lovely one. Without further ado, I’d like to present to you the continuation of Miss O’ Hare’s exciting account of her sudden arrival in Constantinople. We last left our heroes descending through the storm and into what they hoped was a city, rather than certain doom. Let’s see how they did…. “Kristoff! Now!” I held tightly to the wheel as he pulled the lever with all his might. Our descent leveled off with a speed that made our stomachs flip-flop inside of us, and I got a glimpse of the lights of the city, now at our eye level, before we struck the ground with a mighty thud and were knocked off our feet. We lay there for a long moment, breathing deeply and trying to calm our nerves, before either of us spoke. Kristoff broke the silence with a quiet, “Ow.” I sighed deeply and pushed myself to a seated position. “I concur. Unfortunately, we’re not done here.” I pushed myself to my feet on shaky and slightly nauseated legs (I hate sudden landings. Hate them!) and staggered toward the door with determination. Kristoff groaned and pushed himself up onto his elbows. “What? Do we need to crash again? Because once was enough for me, thanks.” He pulled himself to his feet with the help of a trusty guardrail and trailed after me. “Well, if you’d like to avoid any more crashes tonight, we need to go outside and anchor the ship.” I hurried down the steep flight of steps into the hold and opened the door to the driving wind and rain. I grimaced at the awful weather but snatched up the sledgehammer I needed to anchor the stakes and headed out into the storm. Kristoff stuck his head out the door behind me. “Are you mad?” he shouted as I removed the first of the anchor stakes from the outside of the airship and prepared to drive it into the ground. “It’s freezing out there! You’ll catch your death!” I rolled my eyes and commenced pounding the first stake into the muddy grass beneath my feet. Kristoff staggered out into the wind with the rope as I had asked, and held the sledgehammer while I tied the wet knots with the surety of a sailor. “Three more!” I shouted to him as we darted through the pouring rain and howling wind to the next mooring point. We struggled a bit with that one, but by the third we had learned to work together quickly, and with the fourth it was as if we’d been mooring airships in the pouring rain for years. It certainly felt like I’d been out in that rain for years, I grumbled inwardly as we hurried back into the hold with numb feet and soaked clothes. I returned the sledgehammer to its tool hook and hurried upstairs to the galley and the iron stove that lived there with a fire always banked in its belly. Kristoff followed, dripping water onto the floor, and collapsed into a chair as I threw coal on the banked embers and stoked the fire. “Does this happen often? Crashing, I mean?” He stared out the window at the rain-blurred city lights. I wrung some water out of my skirt and warmed my hands in front of the stove with a shiver. “Not usually. Normally I have a bit of warning about storms and can land before they become an issue. This one was moving fast and I didn’t predict it.” I turned from the stove and grabbed the kettle. I could at least start some water for tea before I went and changed out of my wet things. Kristoff looked up as I moved and made a sound the likes of which I’d never heard before. It was like a mouse being startled by a large piece of cheese that it didn’t think it deserved. “What…” I trailed off as I looked at him, kettle suspended in my hand just above the top of the stove. Confused, I set the kettle on the stove and looked down at myself. I was, in fact, in my nightgown… Which was made out of sensible black cotton, had cap sleeves and fell to my calves. It was, admittedly, very wet. And cold. And plastered to me. But still… My eyes snapped back up to him. “You just now noticed?” I suppressed a laugh. “I didn’t exactly have time to change, unlike some people…” I indicated his soaked trousers and dress shirt. I pursed my lips. He had, in fact, been wearing the same suit in various combinations since I picked him up. I had simply assumed he was very attached to that suit. I had a favorite wrench, after all, so who was I to judge what other people liked? Hello my colleagues! I hope you’re all having an enjoyable weekend. I am feeling much relieved, having found an entry in Miss O’ Hare’s diary with a more detailed account of her and Kristoff’s sudden arrival in Constantinople. 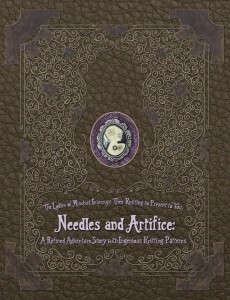 As you know, she loves to write good yarn (and knit with one too) so I’ll present the first part for you now. Enjoy! Well, that was a fine greeting for Kristoff’s first dirigible journey! A raging storm nearly tore us out of the air and we were forced to make an emergency landing in the dark and howling winds. He behaved quite admirably, I am pleased to report. The storm blew up on us suddenly in the night as we were close to reaching Turkey’s borders. I had planned to stop at Constantinople for refueling and resupplying anyway, but I did not wish my landing to be so rushed and dangerous, and I certainly do not welcome being awoken by the ship shuddering and tossing me from my warm soft bed onto the cold wooden floor. Why must everything happen in the middle of the night? Why can’t it happen at tea, when I’m awake and alert anyway? The howling winds and beating rain outside quickly brought me to full wakefulness, and I made my way to the bridge with all haste and collided with Kristoff in the narrow corridor. “All right, that was admittedly a rather stupid question!” Kristoff staggered in after me as the ship jerked and bucked against the wind, threatening to throw him into a wall. “What do we do now? Do we wait for it to blow itself out?” He grabbed a guardrail for support, then looked down at it for a moment with a new appreciation. I could almost see him thinking, “Oh, so that’s what these are for!” and I suppressed a smile as I took the helm. “All right. So let’s land, then!” He gripped the guardrail tightly as I began to calculate our descent. I rolled my eyes a bit. Right, because landing in the middle of a gale, in the dark, is something I do all the time. “It’s not going to be smooth! And as I don’t have four hands, I’m going to need you to do some work in here!” I struggled with the wheel as the wind threatened to rip control of the rudder from my hands. Kristoff made to take it from me, but I shoved him off with one shoulder and planted my feet firmly. “Not the wheel! This is my dirigible, you’re not learning to fly it in the middle of a bloody tempest!” I jerked my chin to my right, where the controls for the wing flaps were located. “I need you on those!” Kristoff nodded and staggered to the levers I had indicated, another shudder of the ship causing him to nearly fall on top of them. “What do I do now?” He looked over the unfamiliar levers, quickly taking in the labels. “This one says ‘ascent/descent!’ Is that the one we need?” Smart boy! I nodded absently, squinting through the rain-lashed windshield and hoping we were still above land and not water. “Yes, that’s the one we need! It controls the flaps on the steering wings! When you push it forward, toward ‘descent,’ the flaps on the wings go up and that makes us go down!” I looked from the window to the instruments, and then over to Kristoff and the altitude controls. “Push it forward four notches!” Kristoff nodded and moved the lever, struggling a bit against the force of the wind and the propellers. I felt the slight lifting sensation in my stomach that is always there on descents, and breathed a sigh of relief. I considered for a moment. “Flat land. No mountains. No trees. And hopefully not on someone’s house.” I grinned at him roguishly. “People tend to get a wee bit pissed off when you accidentally land on their house… Not that it’s ever happened to me. Except that one time in Scotland.” I sucked air through my teeth for a moment. “And that other time in Ceylon.” A strange noise distracted me for a moment, and I realized that Kristoff was snickering. I hadn’t heard him do that before… It was quite nice, actually. “Hold on to something! This is going to be bumpy!” I steered us toward the inky blackness on the edge of the sea of lights. I was reasonably sure I wasn’t steering us into the sea, since the lights petered out in a gradient that suggested the outskirts of a city rather than the sharp edge of the coast. We’d find out soon enough, I supposed. As you might guess, I’m anxious to find any more news of what befell them in Constantinople (as it was know then). At least Anna and Kristoff seem to have made it through unharmed, thank goodness, and have stuck together. I’d honestly be much more worried about him surviving in a unfamiliar city than her! I’ll let you know as soon as I find anything.